Eden Hazard scored two brilliant goals for Chelsea in a win over London rivals West Ham that puts the Blues in third. Relive the top goals from Week 33 of the 2018-19 Premier League season, including Eden Hazard's slalom through West Ham's defense. 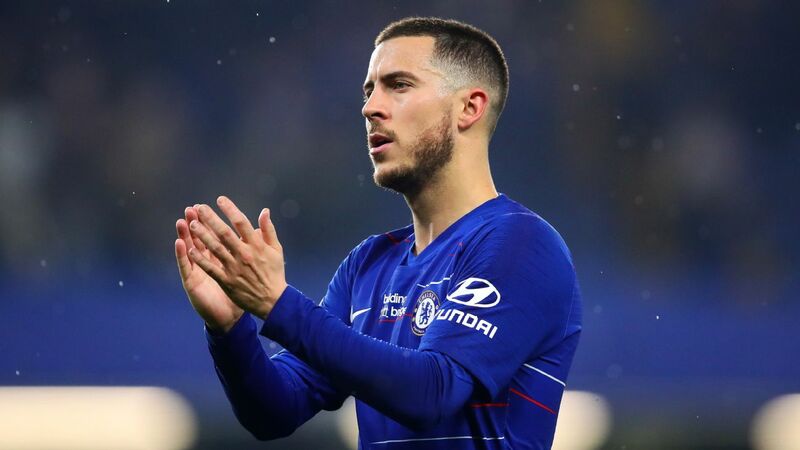 Eden Hazard has told ESPN that he will make a decision on his Chelsea future at the end of the season -- and that it would be "hard" for the club to miss out on Champions League football for a second year running. Hazard has been linked with a summer transfer to Real Madrid, with his Chelsea teammate Gonzalo Higuain telling ESPN that it would be hard to stop the Belgian from leaving Stamford Bridge if he has his mind set on a move to the Spanish giants. Chelsea have reportedly set a price of £100 million for the forward, although manager Maurizio Sarri said following Hazard's sensational performance against West Ham United on Monday that £100m would be "too cheap" for the 28-year-old. "I'm just focused on Chelsea," Hazard told ESPN. "One month to play, top four, try to win the Europa League. For the fans I think the most important thing is when they see me on the pitch they just think that my head is with Chelsea. Chelsea face a battle to get back into the Champions League ahead of next season. Hazard's two goals against West Ham sent Chelsea third in the Premier League table and back above Tottenham and Arsenal in the race for the top four, but the side have a difficult run in with trips to Liverpool and Manchester United to come. The club could also qualify for the Champions League by winning the Europa League, where they face Slavia Prague in their quarterfinal first leg on Thursday. Summer transfer sagas: Will Hazard join Real Madrid? If Chelsea miss out it would be the second year in a row that had failed to qualify for the competition -- after they finished 5th under Antonio Conte last season. And with the club unable to sign any players until July 2020 due to a two-window FIFA transfer ban, Hazard said Chelsea would be at a disadvantage if they are left playing in the Europa League again next season. "Two years in a row not playing Champions League is hard for the players but also for the club," Hazard said. "Chelsea has to play in Champions League every year, but it's hard because we are not the only team that is trying to play Champions League. "But that's why we are doing everything at the moment to try and stay in the top four."